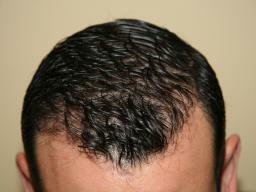 Increasingly effective technology has allowed technicians to replace thinning hair with remarkable effectiveness. One of the best treatments available is follicular unit excision and replacement. This treatment can be described as a form of hair ‘transplant’ where healthy strands of hair are extracted from the scalp, along with their productive cells, and grafted into an area of the head where hair loss is evident. In large transplant sessions, anywhere between 1 500 and 3 000 grafts can be done at once. A follicular unit excision and replacement treatment can even be done with a machine, called a NeoGraft, which mechanically extracts the follicular units and transplants them to new locations. Hair cloning is another emerging trend in hair restoration techniques that has the potential to revolutionise the battle against hair loss. This treatment is conducted by selecting up to 50 donor hair follicles and regenerating the cells to produce the end result of about 1 500 cells. These cells are then transplanted into a new area of the patient’s hairline. In addition to these trends, hair rejuvenation is no longer limited to hair restoration on the head. Eyebrow and beard transplants are also increasingly popular to keep pace with the trend of thicker facial hair and brows. Eyebrow and beard transplants are done through follicular unit excision and replacement and are highly effective at filling in small patches of baldness in beards, evening imbalances in facial hair hairlines and restoring thickness to over-plucked or naturally thin brows.